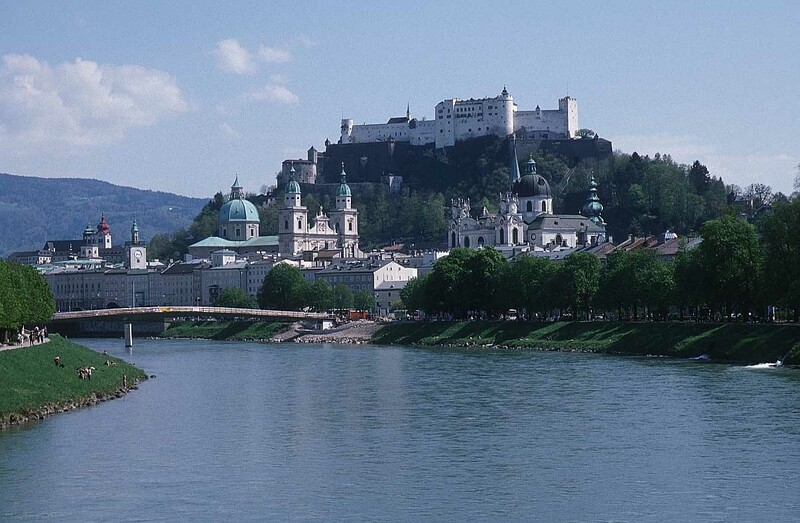 From the 8th century, barges carrying salt on the River Salzach had to pay a toll, and in 1077 the authorities built a “salt castle” (or “salz burg” in German) to control the river trade. 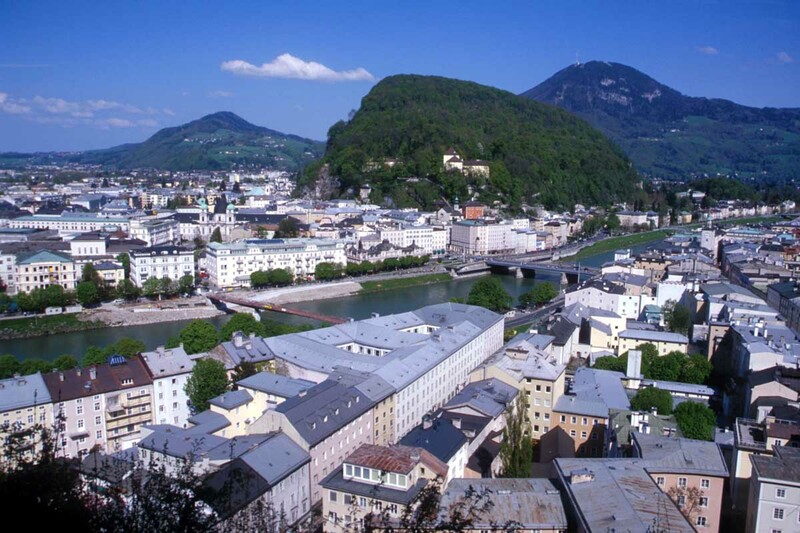 Formerly part of the Roman Empire as the city of “Juvavum”, Salzburg prospered in the medieval period and many Romanesque and Gothic churches and monasteries were built, along with Hohensalzburg Castle, situated, as its name suggests, on top of the Festungberg, the highest point within the city. 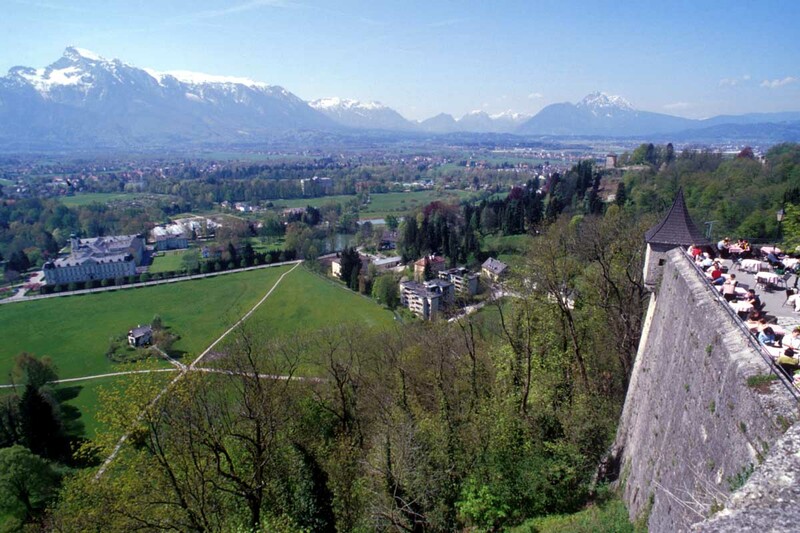 > Construction was begun in 1077 and the fortress was continually extended until the 16th century. 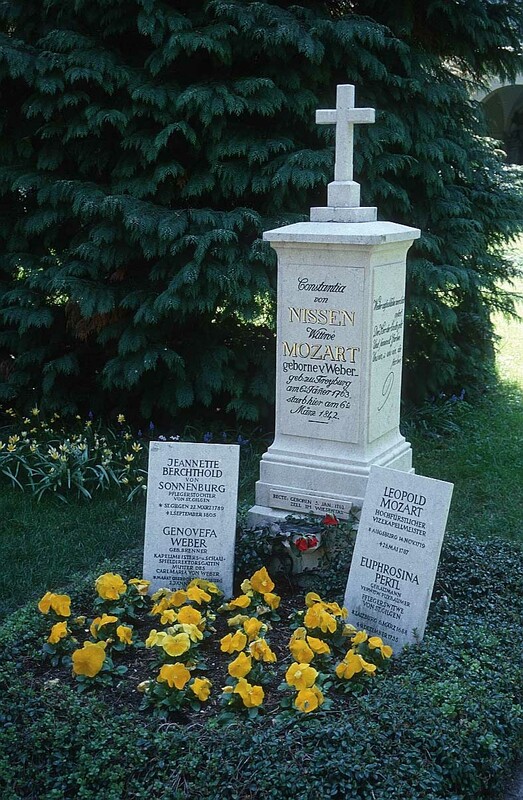 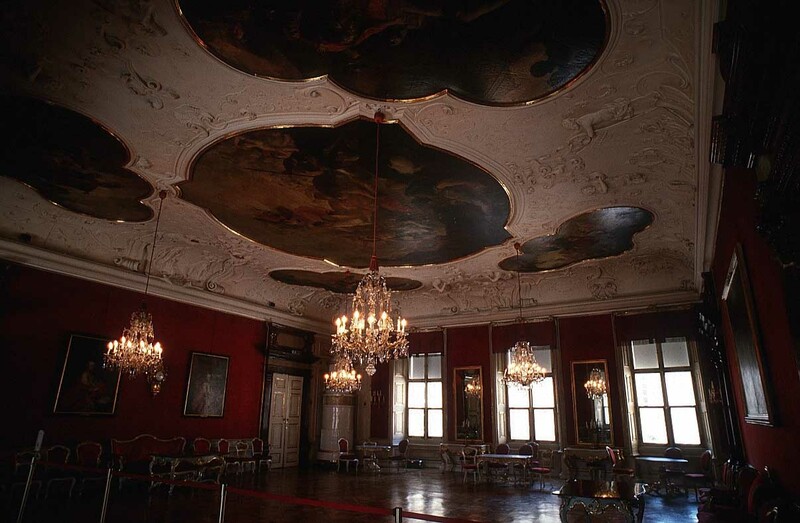 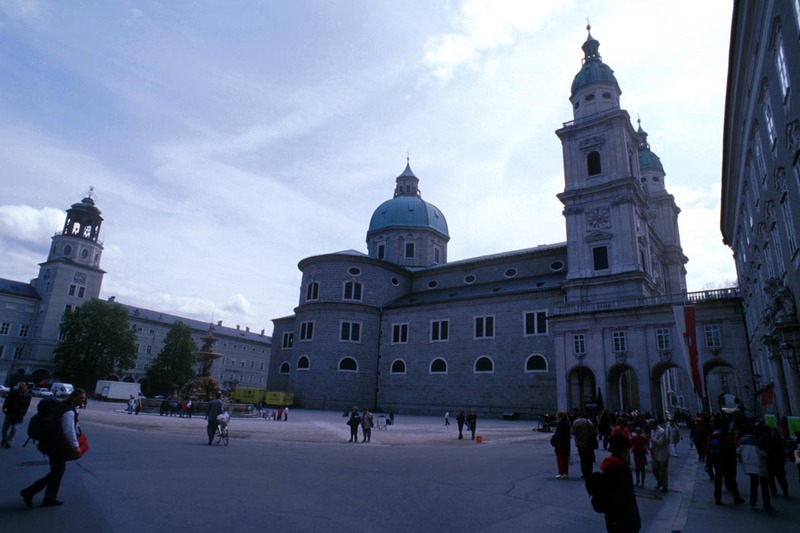 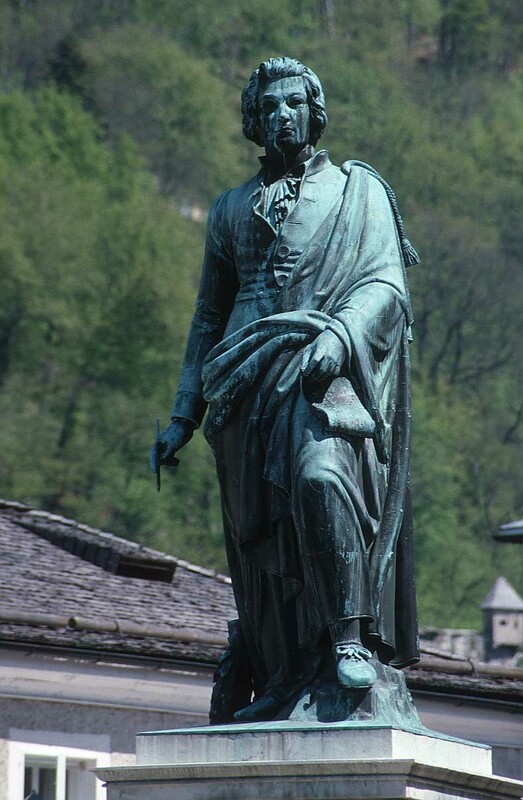 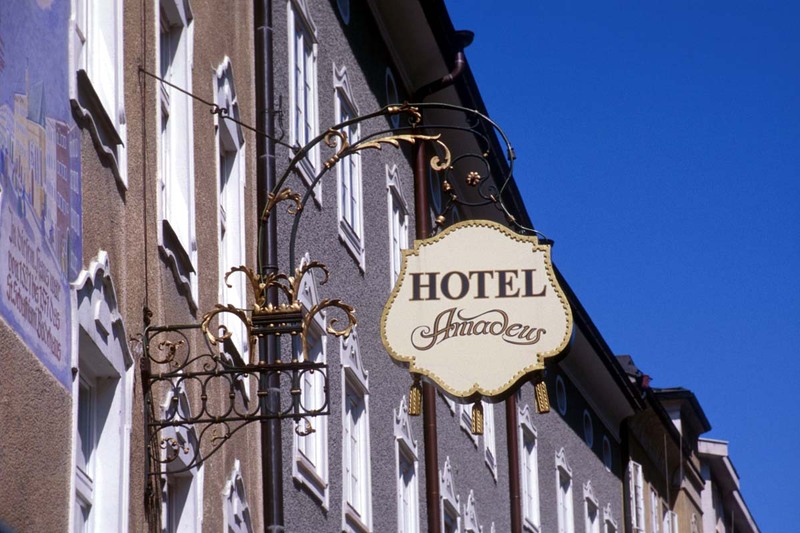 It was a place of refuge for the archbishops of Salzburg. 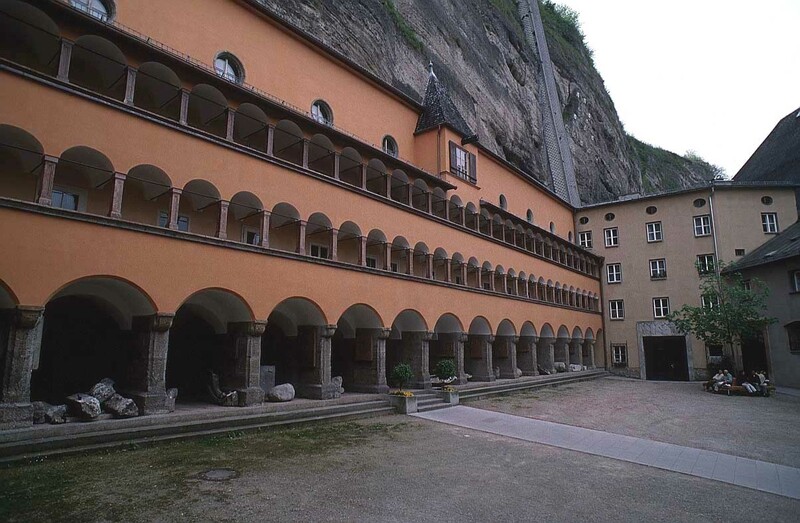 The fortress is open all year and there is a funicular to take you to the top of the mountain, although unfortunately there is no access to the castle for handicapped people. 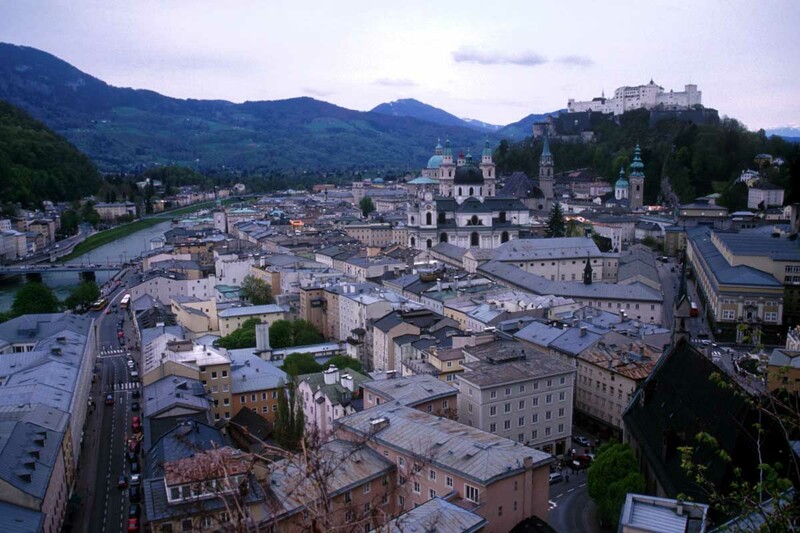 You see on the tour the state rooms and courtyards, a Marionette Museum, the Fortress Museum and a torture chamber; you can also climb the lookout towers. 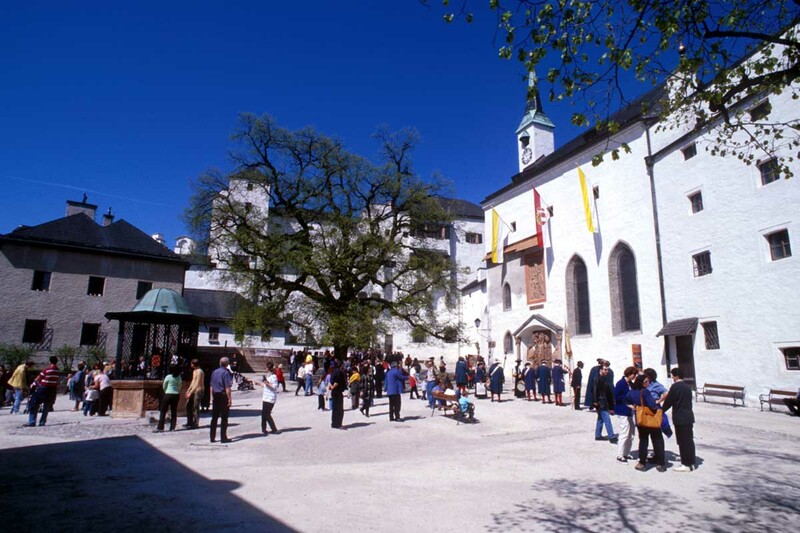 Also not to be missed from this medieval period is the Franciscan Church in the old town, part of the Franciscan monastery. 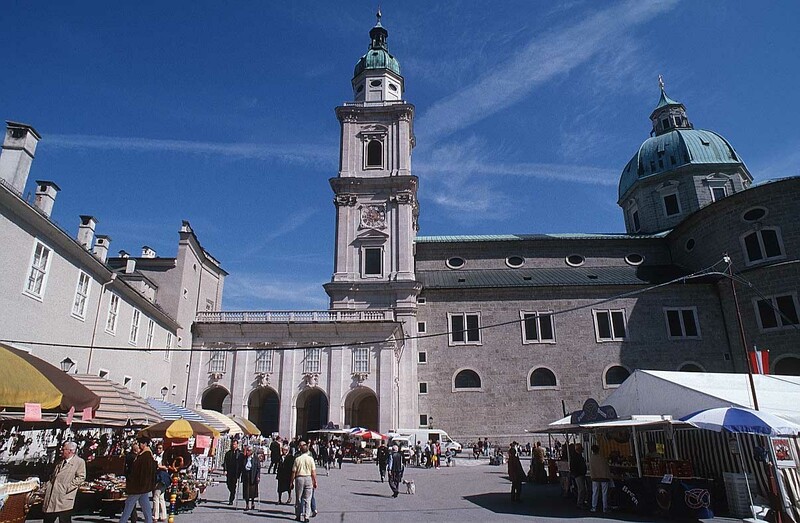 This is one of the oldest churches in Salzburg and is notable for the contrast between its dark, Romanesque Nave and the lighter, highly decorated Gothic Choir. 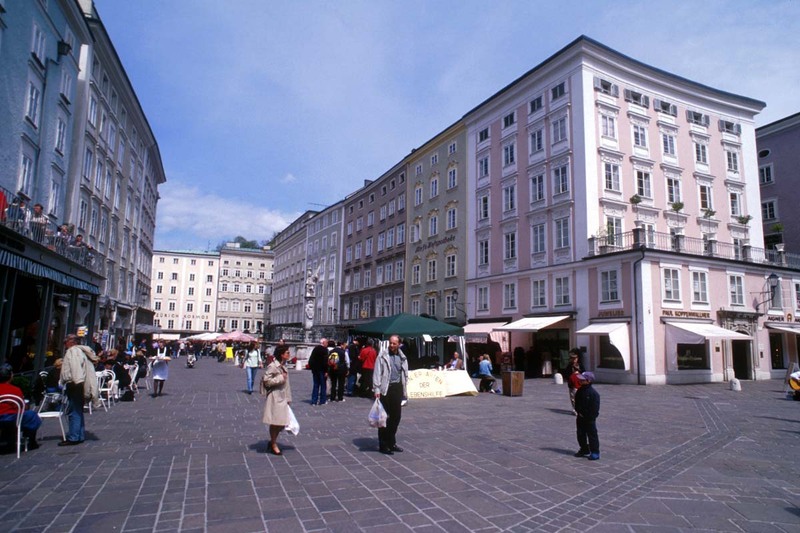 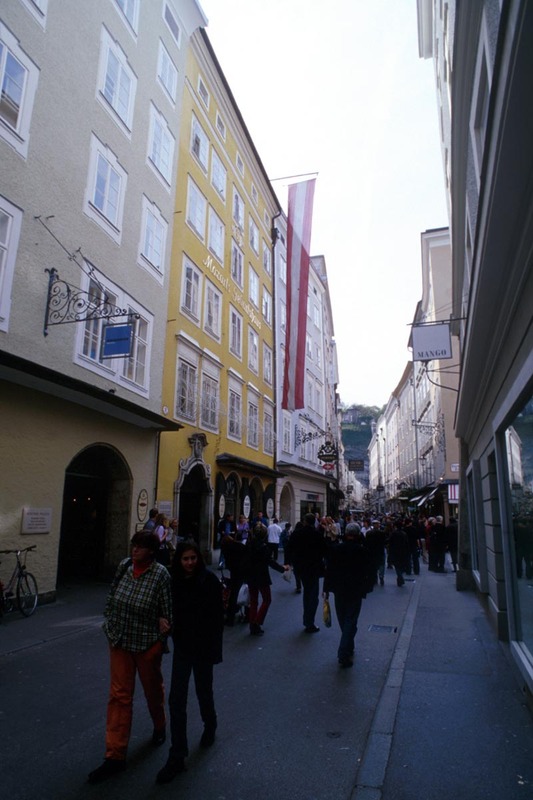 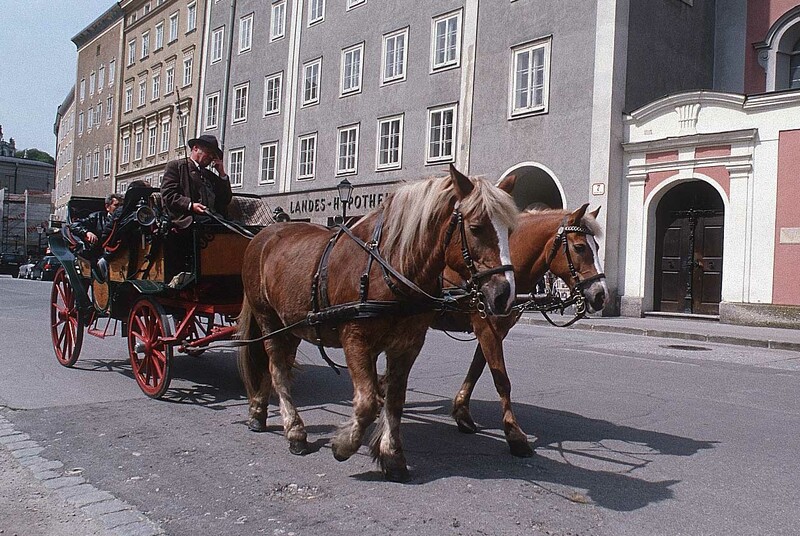 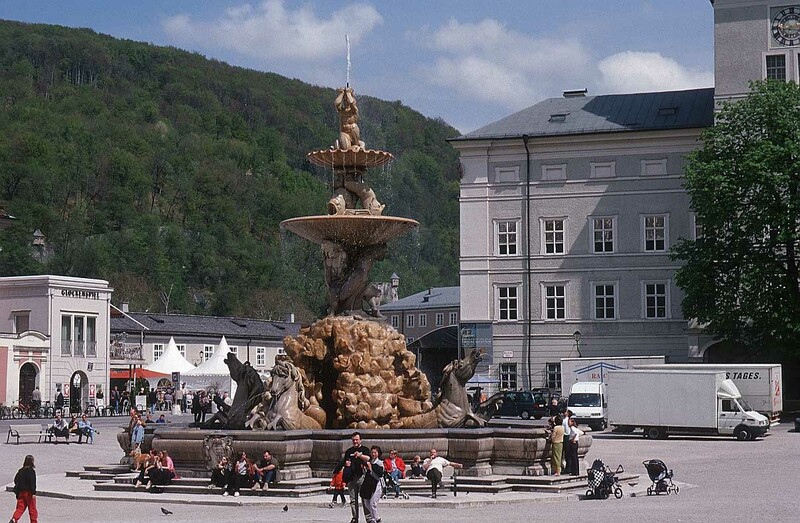 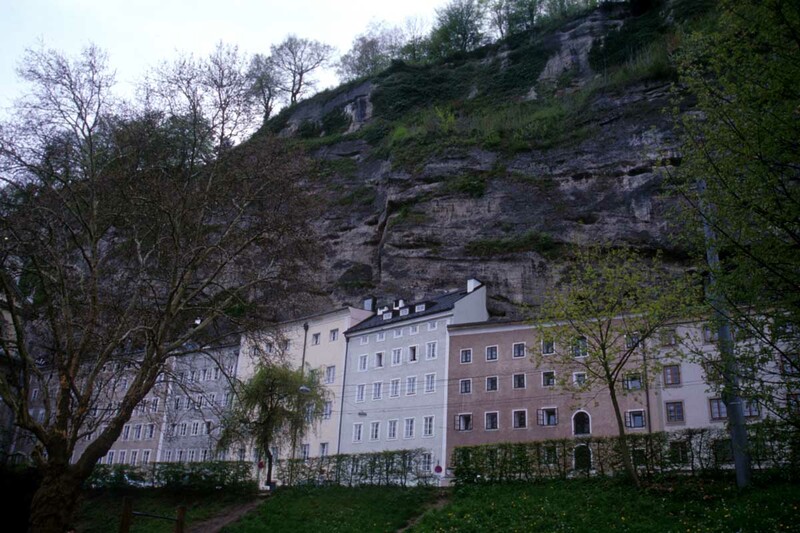 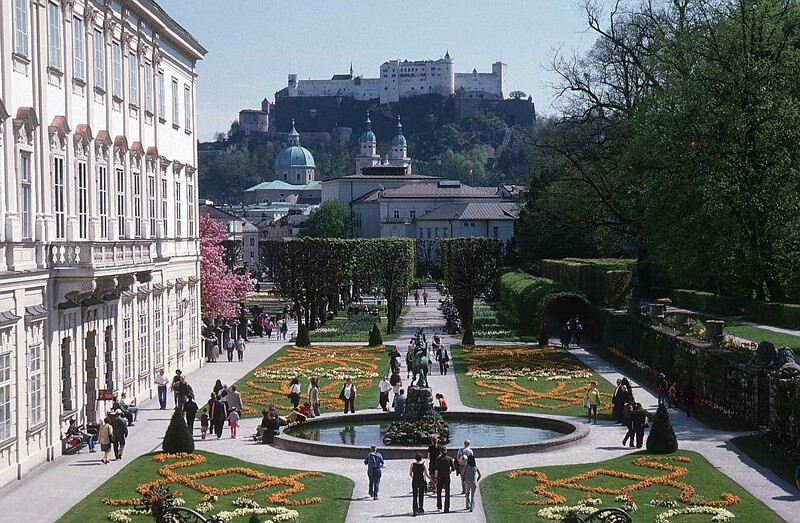 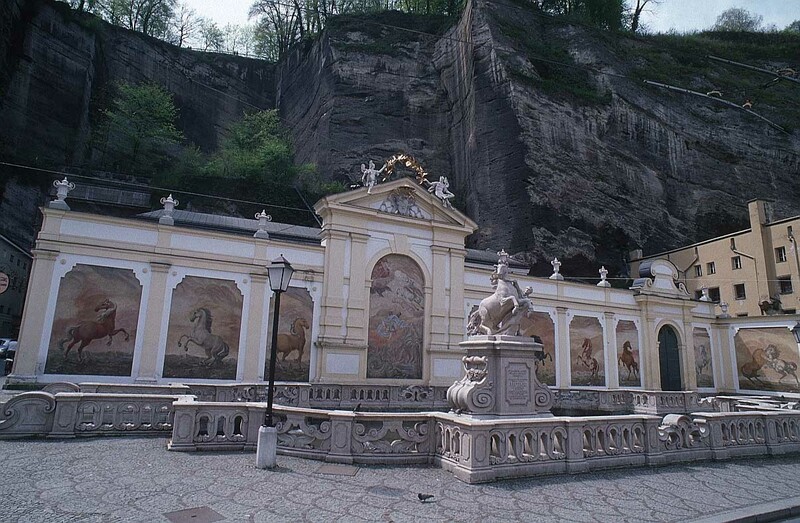 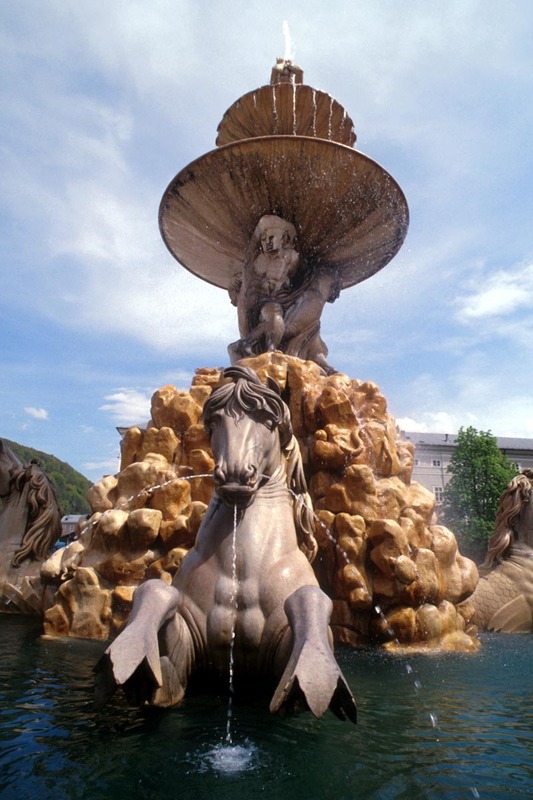 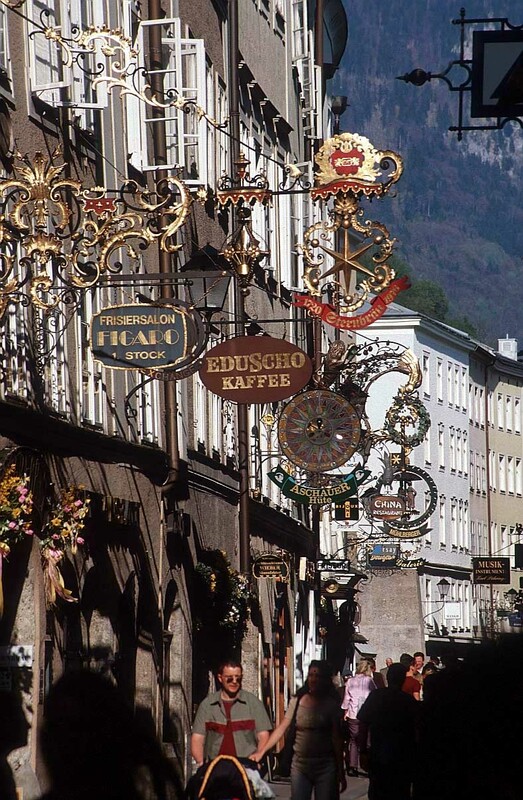 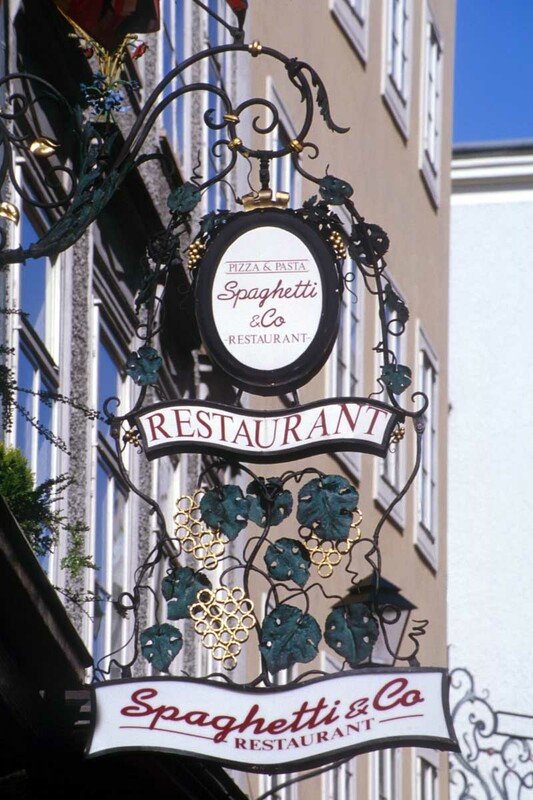 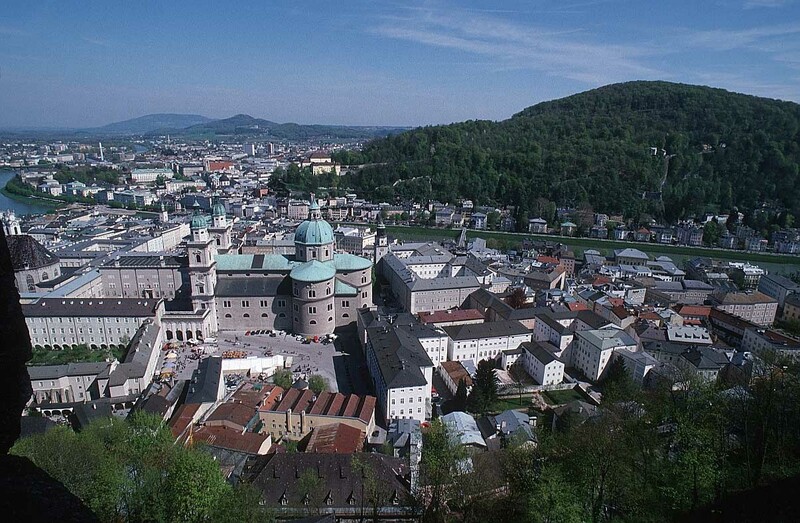 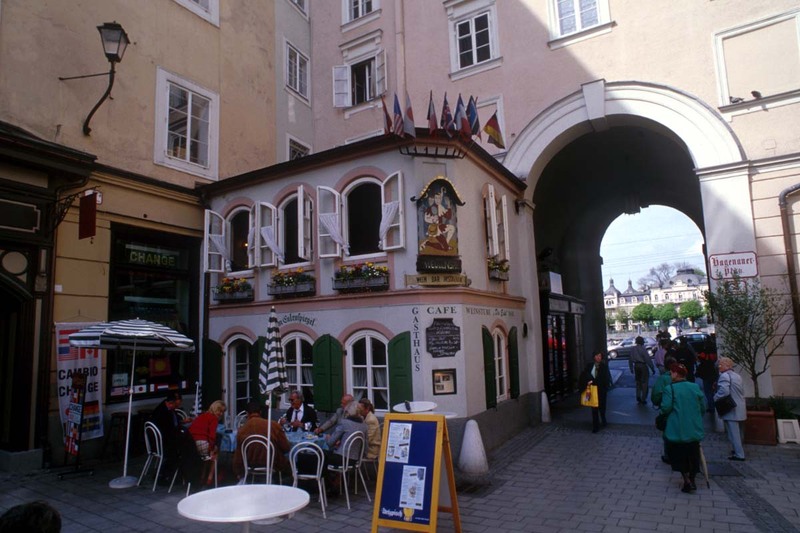 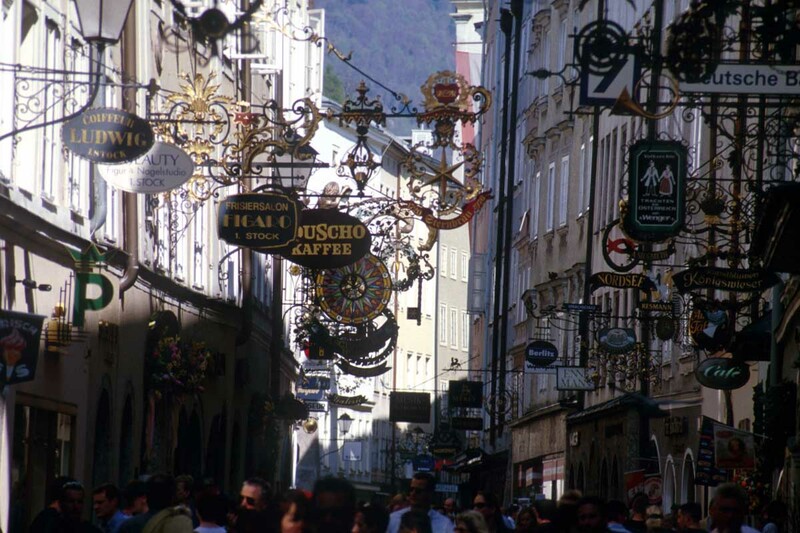 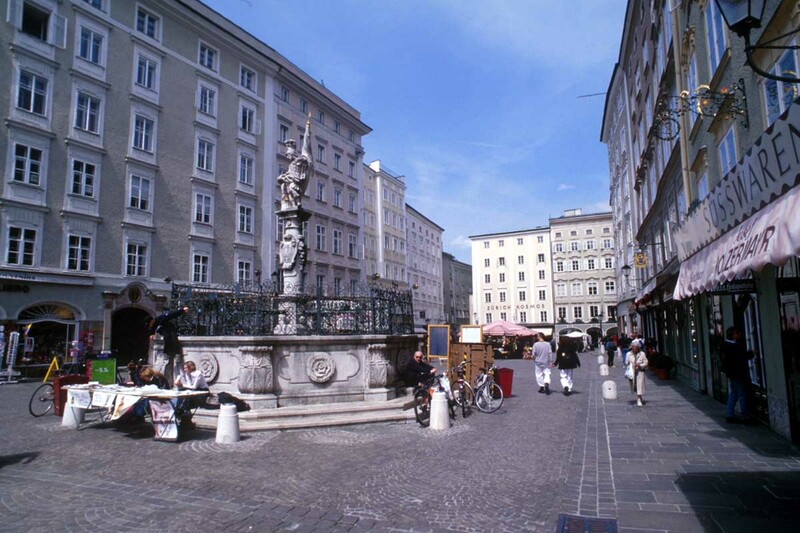 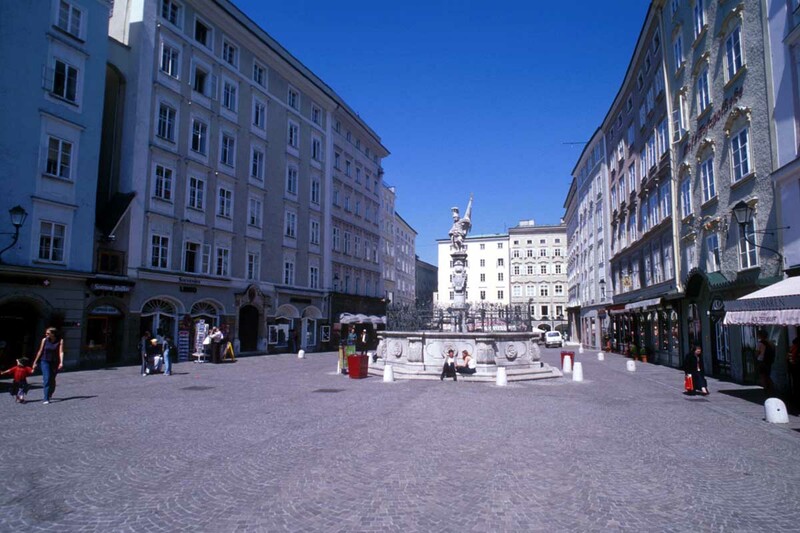 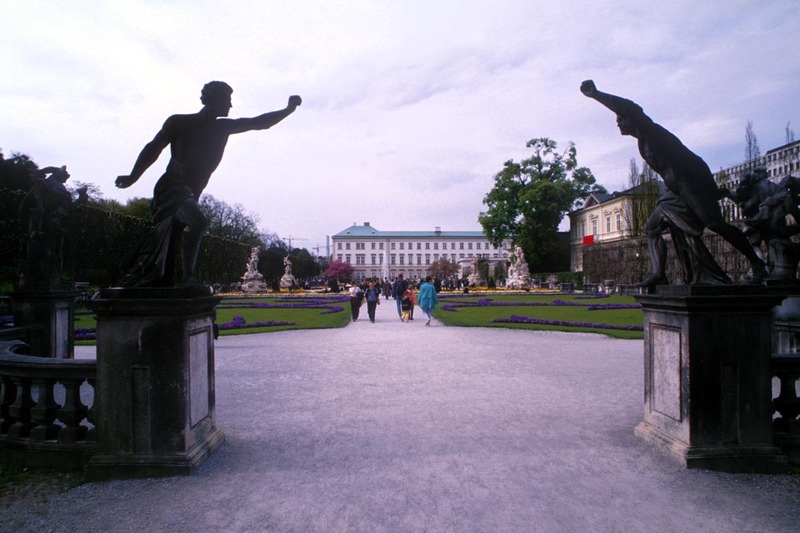 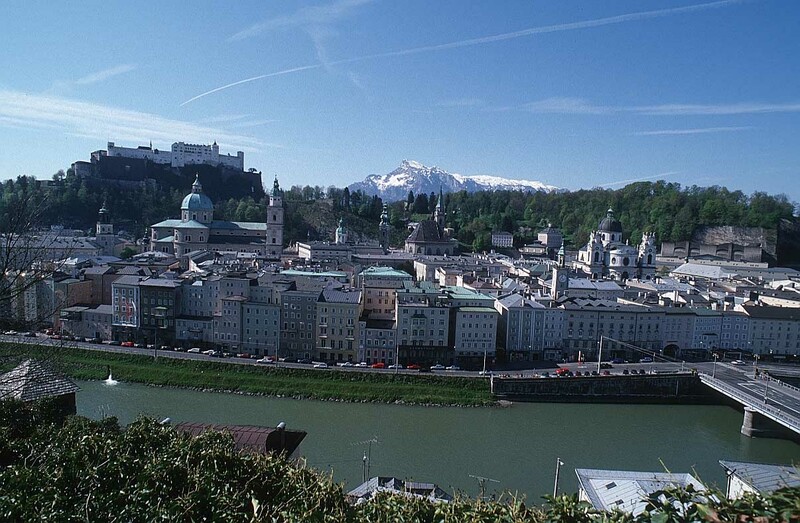 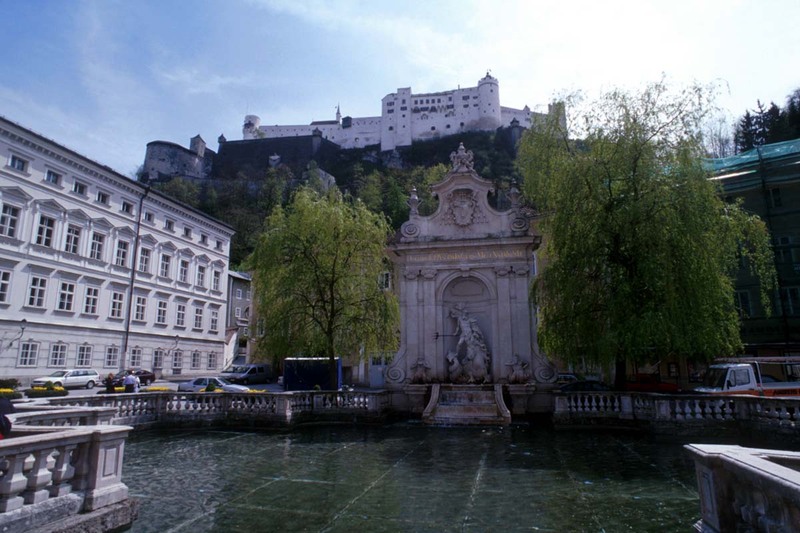 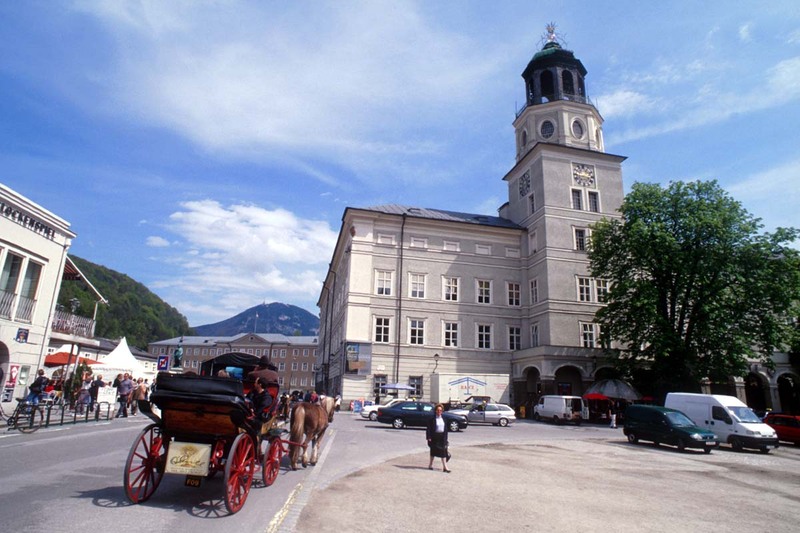 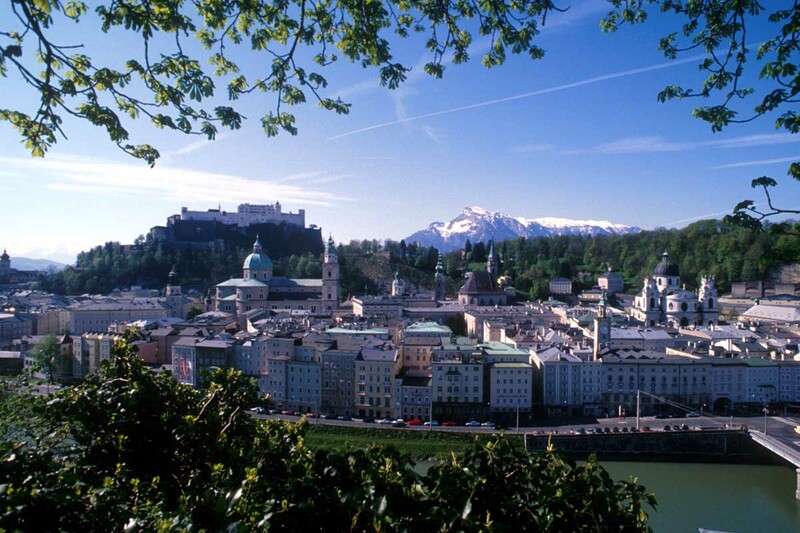 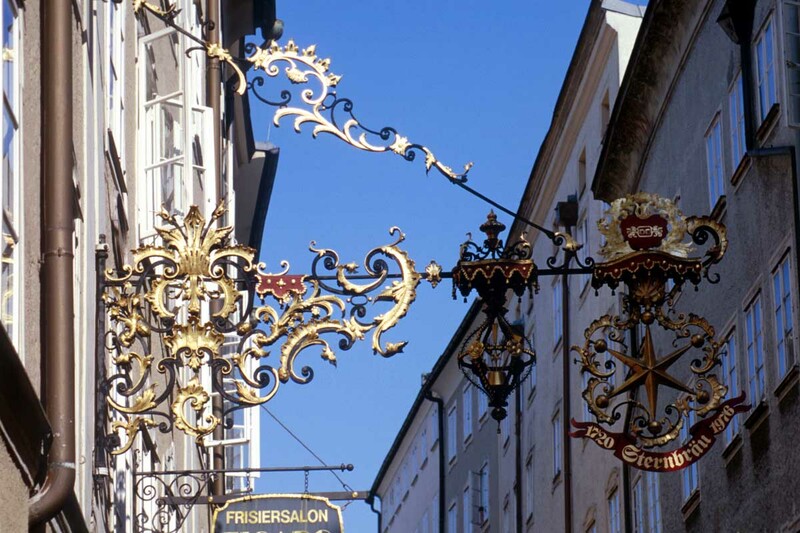 Much of the city of Salzburg was rebuilt during the Renaissance period in the baroque style. 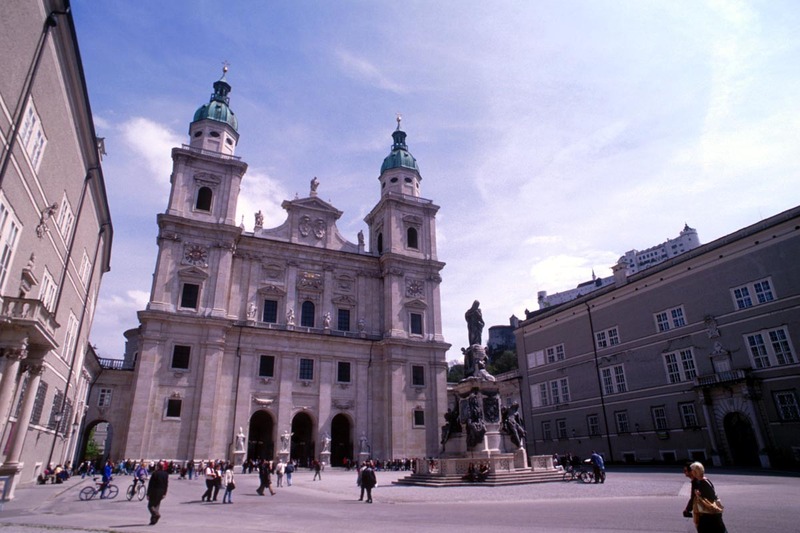 Salzburg Cathedral (Dom zu Salzburg), the most important building in the city architecturally speaking, also houses some interesting objects, including a font in which Mozart was baptised, and a magnificent organ. 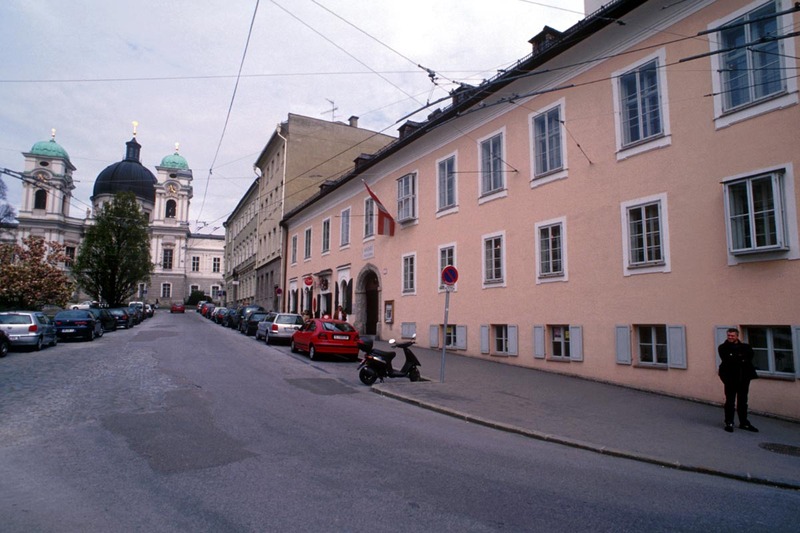 The Dom is open every day except during Mass, and admission is by donation. 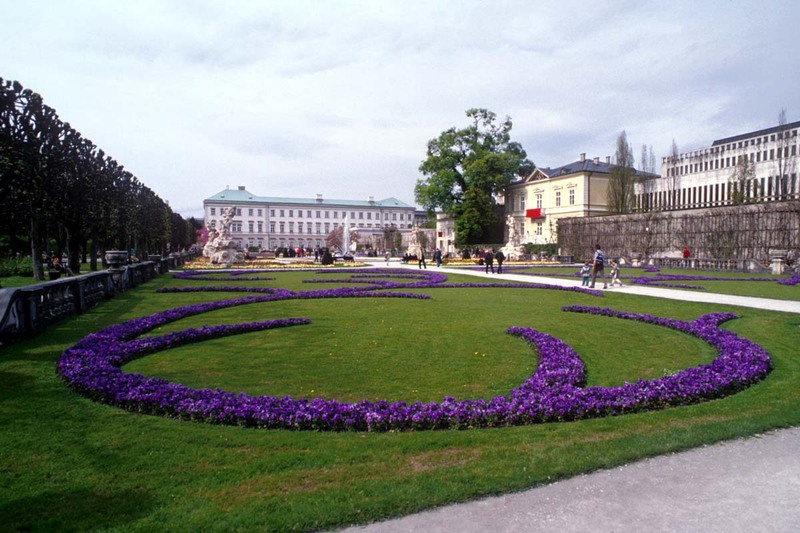 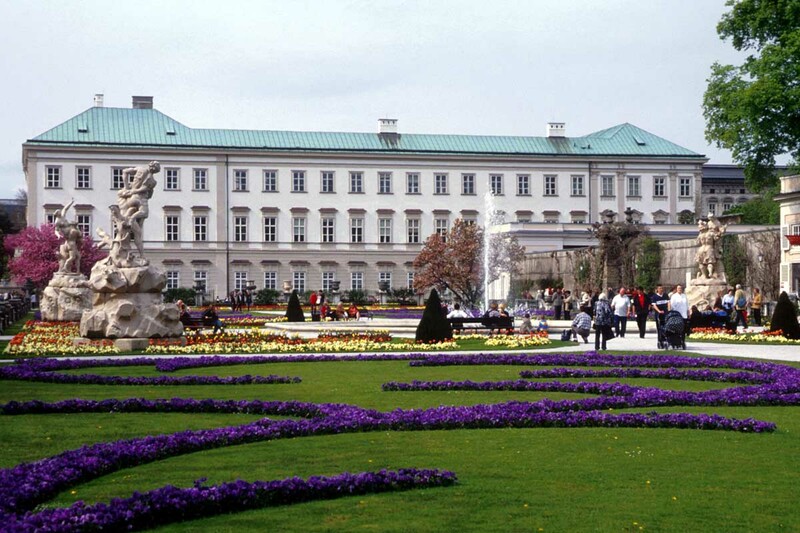 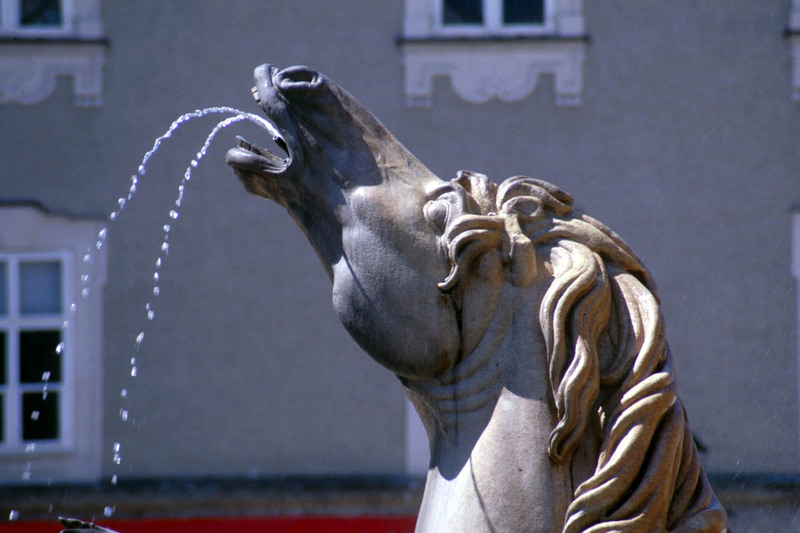 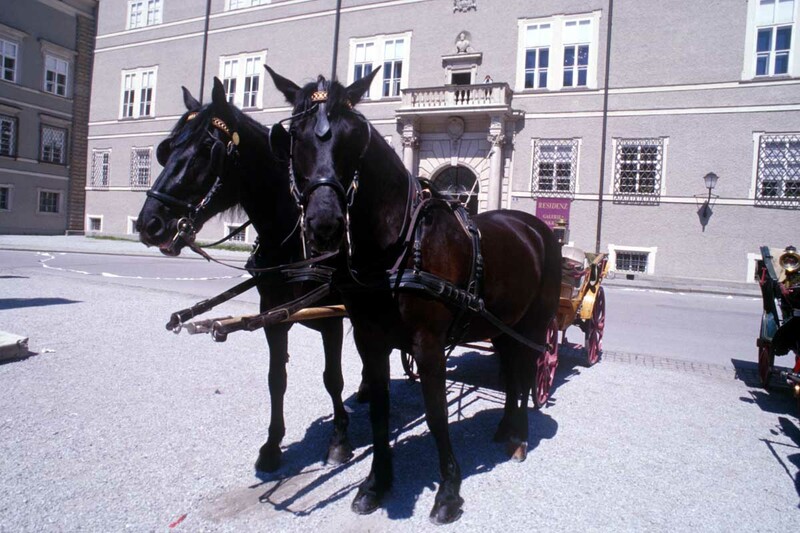 You can also visit the baroque suburban villa, Hellbrun Palace, built in 1619 a little to the south of the city centre, giving room for charming gardens and trick water fountains. 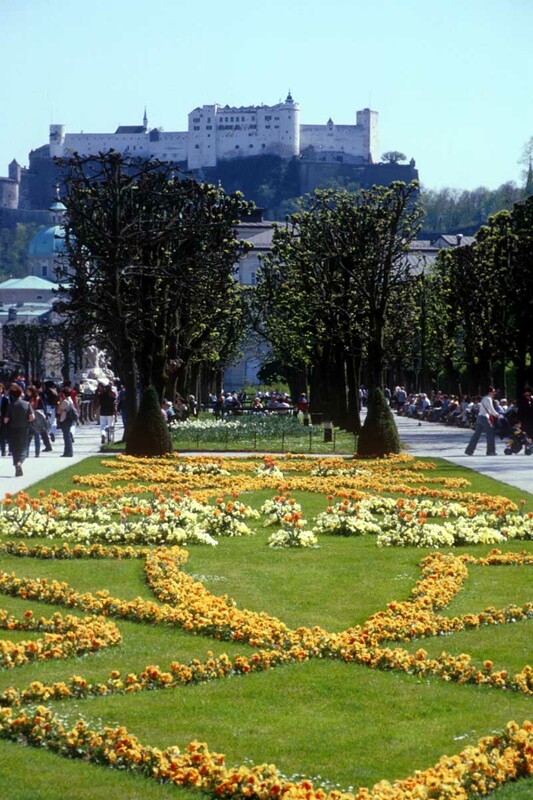 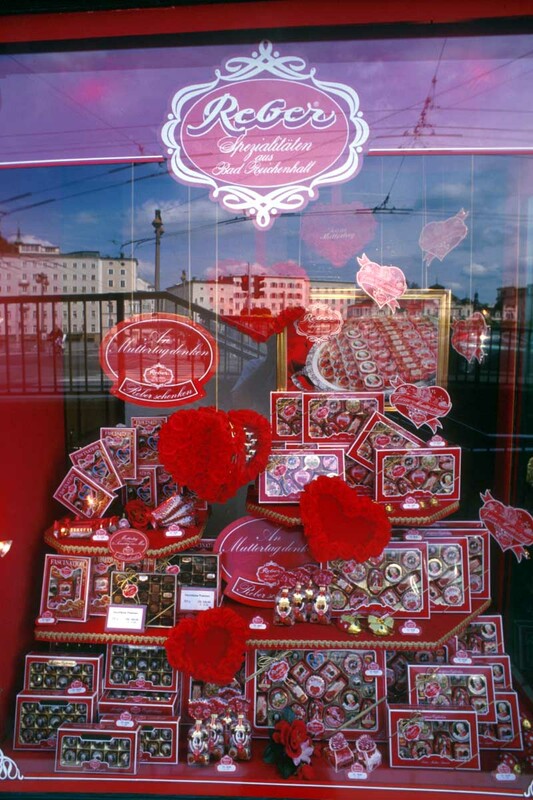 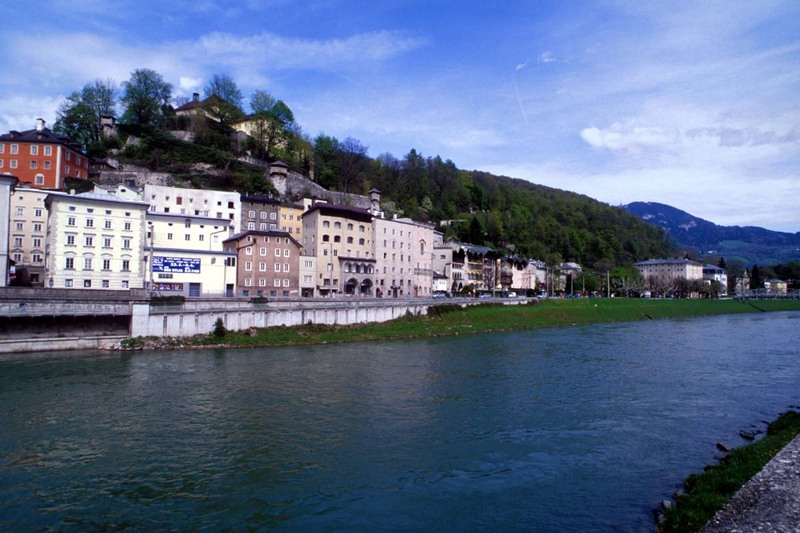 Although at times in its history under Bavarian rule, Salzburg is now capital of the Austrian district of Salzburg, with a population of 144,000. 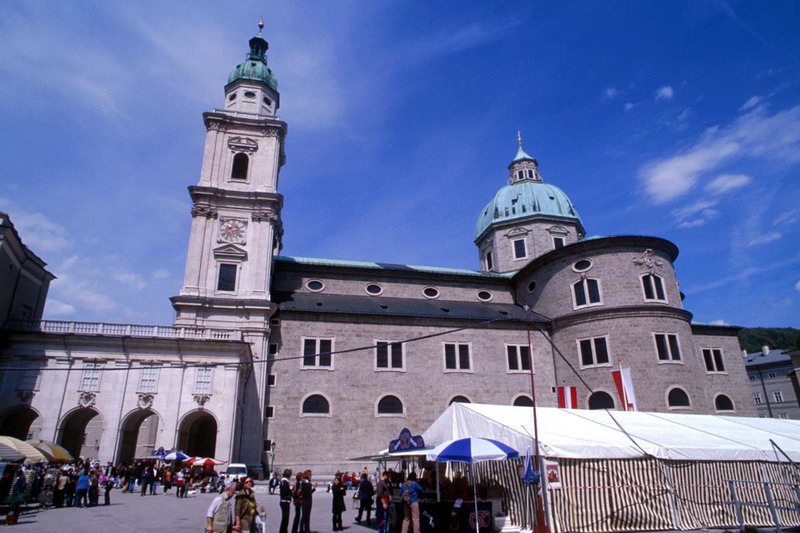 Although damaged in the Second World War, enough of its historic architecture remained intact for it to be granted UNESCO World Heritage Status. 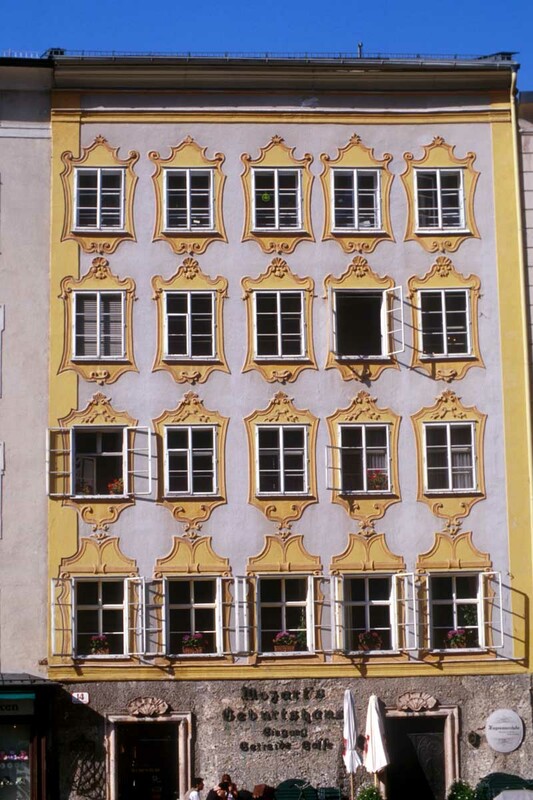 Our photo gallery (with free download) shows some of the fine buildings in the city. 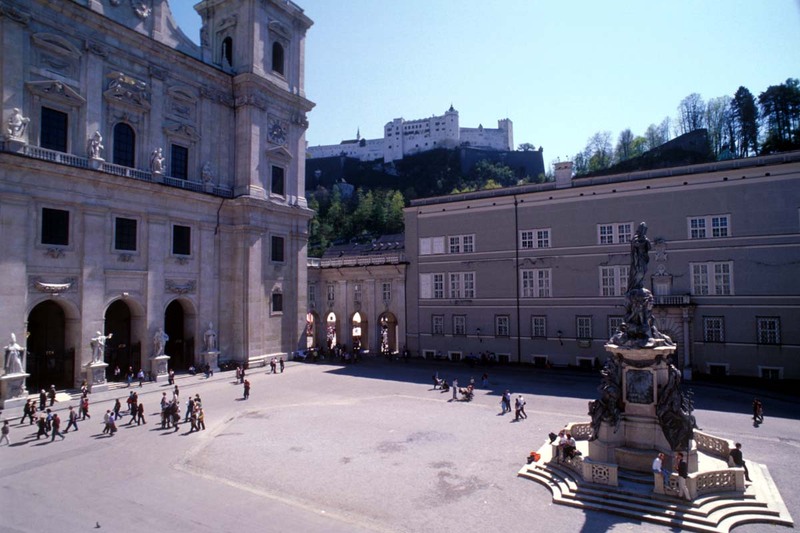 St. Peter's Benedictine Abbey, the Collegiate Church, the Baroque Mirabell Castle, the Music Academy, the Mozart Museum, the Festival Hall, Residence Square with its fountain, Cathedral Square and Capital Square. 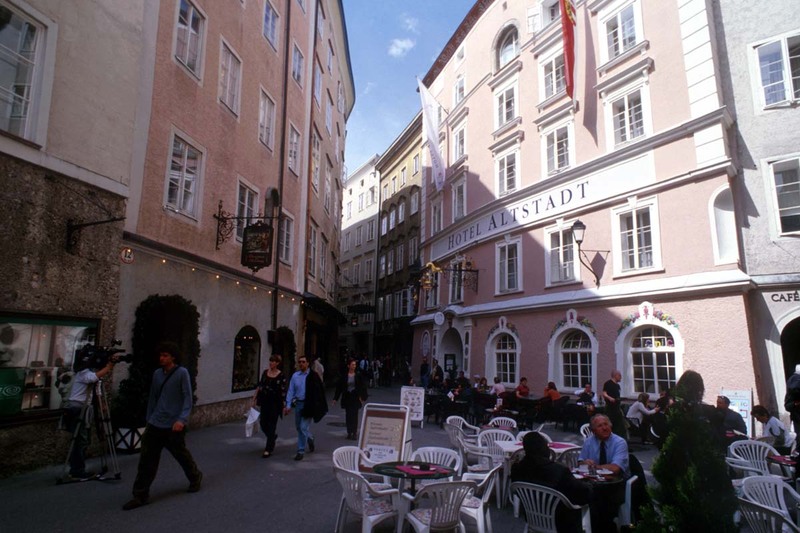 Enchanting Getreidegasse is the touristic heart of the old city, and the most popular destination is the house where Mozart was born.